Trimediazine There are 2 products. 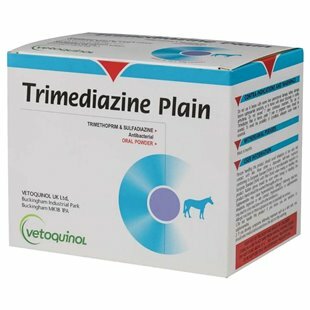 Trimediazine is indicated in the treatment of bacterial infections in horses caused by sensitive micro-organisms including: Escherichia coli Rhodococcus (Corynebacterium) equi Staphylococcus spp. Streptococcus spp. Trimediazine may also be effective in alimentary tract infections including diarrhoea; respiratory tract infections including pneumonia; pleurisy and strangles; wounds, septicaemia and general infections.